It’s that time of year again the end of financial year is just about on our doorstep. It’s almost June 30, so that gives you just under a month to sort out some gifts for your most valued clients. Check out the range of BoxSAlicious corporate hampers on offer to say thank you for your business. 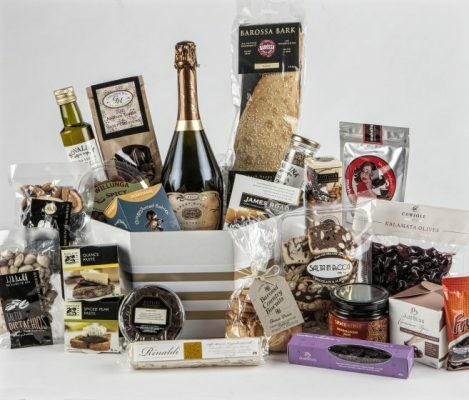 We have a whole range of gift baskets and gift hampers that include chocolate and sparkling wine, as well as a refreshing Coopers Ale with nuts. For the beer lover we have a fully stocked cooler bag featuring craft beers, Lavash and Maggie Beer paste and some fruit and nut products. Why not add a chocolate to sweeten the deal. For the chocolate lovers consider giving the Chocoholics choice with Artisan toffee bark, rocky road, scorched almonds and new to Adelaide – the Violet Crumble! This has to be a favourite, because who doesn’t love chocolate? If you really want to say thank you to a very special client or team, we recommend ordering a gift basket or gift hamper for the whole office to share. What could be more fun than celebrating the end of financial year with our Deluxe Corporate Thank you. This has something for everyone – a real crowd pleaser!